Arugula Salad w/ Pine Nuts | Time to Cook! 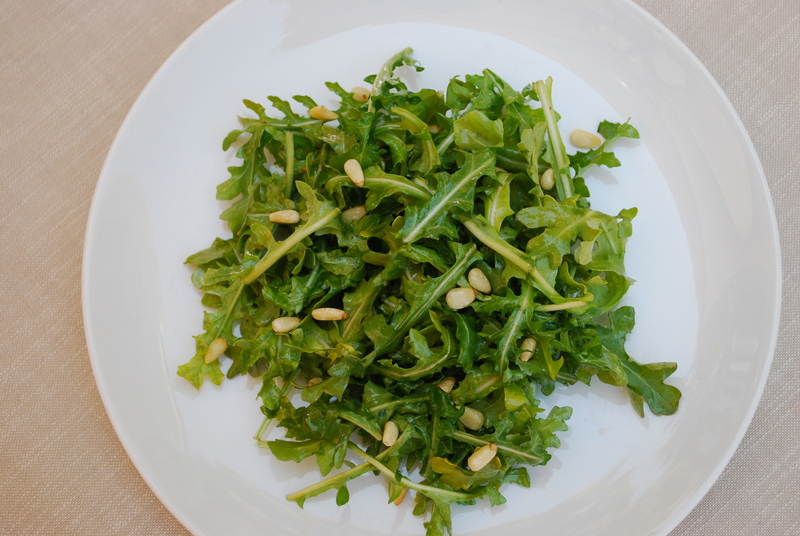 I love this simple arugula salad – the peppery arugula, the nuttiness from the toasted pine nuts, and the zing from the sherry vinegar make a nice combination. This is great served with a grilled cheese or pizza! Toast the pine nuts in toaster oven for 2 minutes or until lightly browned (be careful not to burn!) Set aside to cool. In a small bowl prepare sherry vinaigrette: combine 1 tablespoon sherry vinegar and a pinch of sea salt flakes; whisk in 2 1/2 tablespoons of extra virgin olive oil. Grab three handfuls of arugula and toss into a medium mixing bowl. Add pine nuts and as much sherry vinaigrette as you desire. Toss and season to taste with more salt, if needed.